Essential Oils and Babies – Do They Go Together? Do essential oils and babies go together? Thats a good question natural beauties. Read on to find out the best way to use essential oils around babies. Babies – only use essential oils in their environment – not on them! Can you use essential oils on babies? Short answer = YES – but not on them directly. Long Answer = YES but you must use caution and follow these rules. * do not use essential oils, diluted or neat, on your baby unless you seek medical advice. * do not put essential oils into the bath, diluted or neat. You can use essential oils with your baby in the environment around them and the best way to do this is to use a diffuser and vapourise the essential oils in their room. You can buy humidifier from your pharmacy specifically made for children so they can breathe easier, and you may also use calming essential oils so they sleep better too. An ordinary motorised diffuser will be fine for this as well, but as a precaution don’t use a burner with a candle. Refer to the model of your diffuser for amounts of oil and if there is no info I would only use 6 drops. If you really want to add something to your baby’s bath you could use some organic herbal tea (a couple of teaspoons) wrapped in some muslin and make a weak infusion. Chamomile and lavender would be the only herbs I would use. In the same vein you could use organic oats which makes a soft, skin soothing bath which is safe for babies and will help soothe nappy rash and hot skin. A dash of hydrosol would be fine too. A great alternative to essential oils that works well with babies and kids are hydrosols and floral waters. They have a mild scent and are safe you to be misted all around your baby to help induce a sense of calm and also for cooling them down in summer. The best hydrosols will be rose, lavender, roman chamomile and neroli (or orange blossom). See my article Hydrosols vs Floral Waters – What’s the Diff? for more information. 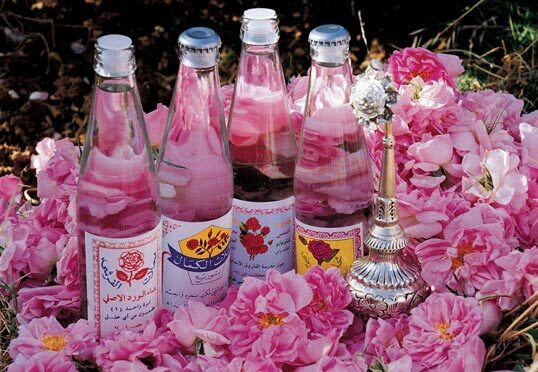 You will find rosewater and orange blossom water in some food stores and to be on the safe side I would water these down, otherwise buy a good quality (organic if possible) hydrosol from a natural beauty/aromatherapy store. I have referenced 3 text books and only one leans towards avoiding eucalyptus with young babies. It has an active ingredient called 1-8 cineole that can be toxic in lethal doses but nothing like a couple of drops you would use in a humidifier. It may be best for me to update this article to be very specific about using eucalyptus with babies. It is still one of the best mucolytic oils. Fir, pine and/or spruce could be used as a substitute for sure, but they won’t be as effective. Also some oils/formulas that are specific for kids & babies, that are sold with humidifiers, contain many questionable ingredients and could even be potentially more dangerous than a drop or two of eucalyptus. Try putting a couple of drops of oil on your clothes and when your hold your baby, they will just get a small scent of oil, mixed in with your scent, and this may work really well to settle them down. Just be careful not to let the babies face touch against you where the oil is. You can see a pattern here – pretty much just stick with lavender and a few other oils until your baby is older. Please your you motherly or fatherly intuition with your baby and remember if you use a diffuser the whole family will benefit from the aromatherapy treatment too. This entry was posted in Aromatherapy basics & how-to's, Essential oil recipes, Essential OIls and tagged aromatherapy, bergamot essential oil, essential oil recipes, essential oils, essential oils for babies, essential oils for baby's crying, essential oils for sleep, essential oils to breathe easy, eucalyptus essential oil, floral water, frankincense essential oil, hydrosol, intention, lavender essential oil, marjoram essential oil, natural scents, roman chamomile essential oil, scent your space, vetiver esssential oil by suzannerbanks. Bookmark the permalink.